Over on FMF recently a commenter named Noah said he'd heard that the total amount of student loans went from $100B to $1 trillion from 1990 to 2012. Sounds about right. Part of that is inflation, part of it is due to more people going to college and part of it is from increased costs of college and finally lower state funding of financial aid impacts debt levels too. It all adds up to increasing debt levels. WE can get some specifics from the Survey of Consumer Finances which has data every 3 hears from 1989 to 2010. I pulled the numbers out of the SCF 2010 data and compiled the chart below. This is showing two things. First is the left axis and the blue bars which is the average amount of debt among people who have loans. 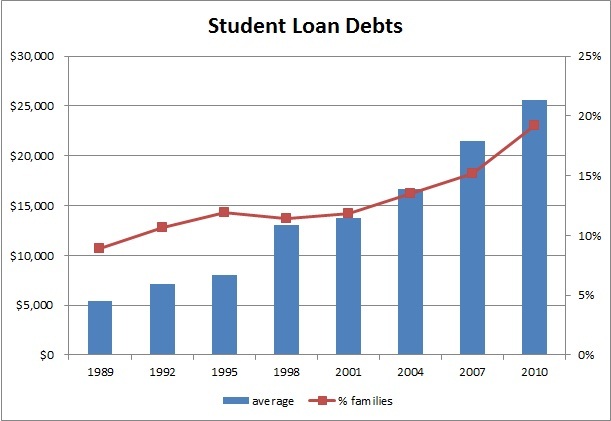 Of course most families do not have student loans and those families are not considered in the average. THe red line on the right axis is the percent of families who do have student loan debt. So for example in 2010 only 19.2% of families had student loan debts and the average they carried was $25,600. Of course the numbers have gone up since 2010 but thats the latest data the SCF has compiled.